Practice the questions given in the worksheet on simple probability to get the idea how to find the probability of different events given in the tree diagram problems. Read the probability questions carefully to match the outcome with its probability. 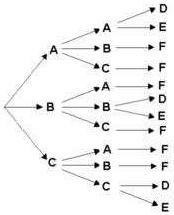 The tree diagram above represents three events. In the first event either an A, B, or C is chosen. In the second event either an A, B, or C is chosen. In the third event either a D, E, or F is chosen. 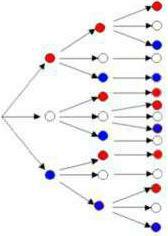 The tree diagram above represents three events. In the first event either a Red, White, or Blue circle is chosen. In the second event either a Red, White, or Blue circle is chosen. In the third event either a Red, White, or Blue circle is chosen. The worksheet on simple probability provides two different types of questions on tree diagram. Solve the questions one by one to match the outcome with its probability.